Here is the best search for you by MLS in the Humber Valley neighbourhood. Have a look! You can search by homes condos or townhomes in the price range you want. 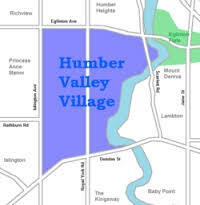 Humber Valley Village is another of Etobicoke's upscale neighbourhoods with unique geography and stately surroundings. Construction of homes in this area began in the 1930s and continued on into the 1960s, resulting in a broad range of architectural styles from Colonial, Tudor, and Georgian, to more modernist and contemporary designs. An ideal neighbourhood for families, the Humber Valley Village offers public tennis courts, baseball diamonds, cycling paths, an artificial ice rink, and 2 schools - Etobicoke C.I. Public High School, and the Humber Valley Village Public School. Find all The Humber Valley Homes for sale at Etobicokeforsale.com! Humber Valley Village is also centrally located, within minutes to downtown Toronto, highway access, public transportation, and Pearson International Airport. As one of the larger communities in Central Etobicoke, Humber Valley Village includes the highly sought after residential areas Lincoln Woods Court, North Drive, Valecrest Drive, and Edgehill Road. Each of the streets are unique in character with exclusive designs and structure all their own. When you make the Humber Valley Village your home you'll enjoy a variety of recreational and shopping facilities, including the St. George's Golf and Country Club, featuring one of Canada's best and most challenging courses. Stroll beside the spring-fed pools and vivid floral displays of the scenic James Gardens, and shop at the fashionable Humbertown Shopping Centre complete with boutiques, bakery, and delicacy shop featuring such specialties as ostrich and quail meat. The Humbertown Centre is about to embark upon a major renovation adding Condo buildings to the site and expanding the Shopping Centre. The estates of Humber Valley Village and the Humber Valley Village Real Estate owners are concerned how this will add congestion to the already high traffic count. The developers have had to reduce their initial projections and brought down the height of their Luxury Condo offerings. The resident owners are concerned about how this will affect the homes for sale in Humber Valley Village. Humber Valley Home prices are all over $1 million dollars and new builds are growing in popularity with a recent luxury home spurt. They are achieving sales of $2 million plus. Our closest Remax office to you is 4242 Dundas Stret West at the Brunos Plaza east of Royal York Rd. Come on in and meet with us!